I've kept some sort of journal for as long as I can remember. I was obsessed with recording every little detail if for no other reason than to make sure I didn't forget anything. My greatest fear was losing important little memories over time. I'll open to a page I filled in high school with descriptions of my daily routine, what swim practice was like that night and what member of the male species had captured my attention. It makes me laugh, but it also reminds me how much I've changed, learned and grown over the years. 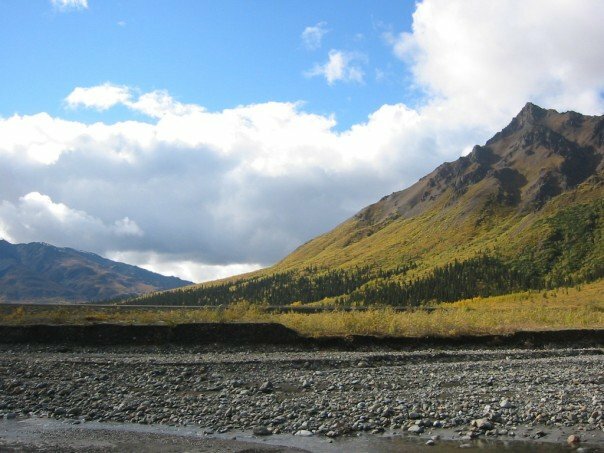 On a hike near the Toklat River in Denali National Park, 2006. It's as important to look back at where you came from as it is to look forward. Our pasts can teach us so much about who we are. Opening old journals and reading old trip reports from my first outdoor adventures both made me laugh and made me appreciate how I've changed. I sure had a lot to learn back then, and I still do! In my "A Look Back" series, I'll share an trip report or excerpt from the journals I've kept. Stories will include everything from my first backcountry adventure in Canada to a then-epic attempted solo overnight in Denali National Park, and from learning what a compression sack was to learning that pump filtering water from a muddy pond won't work. The stories won't be in any particular order, but they're all experiences that shaped my outdoor learning and who I am today. Thanks in advance for reading the new post series!